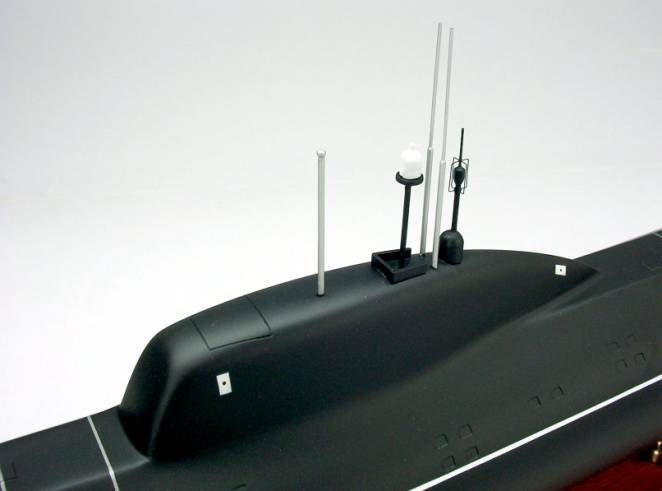 The Project 971 Ahuka-B attack submarine multi-purpose submarine is capable of strikes against groups of hostile ships and against coastal installations. 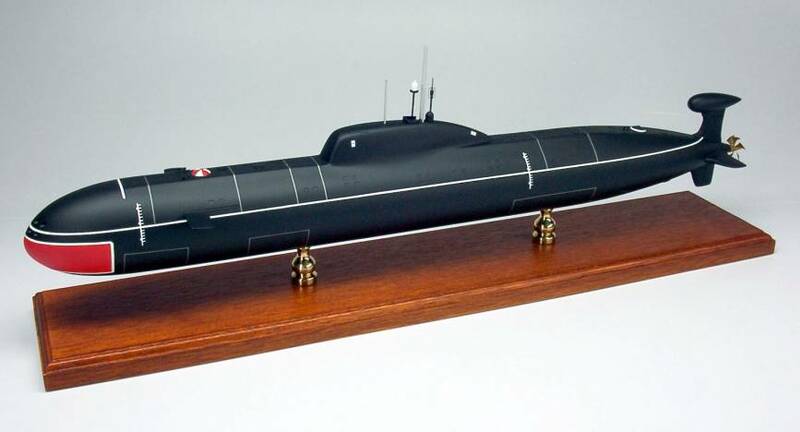 Designated the "Akula" class by the West, the submarine is officially designated Project 971 Shuka B (shuka is an aggressive breed of fresh water pike). 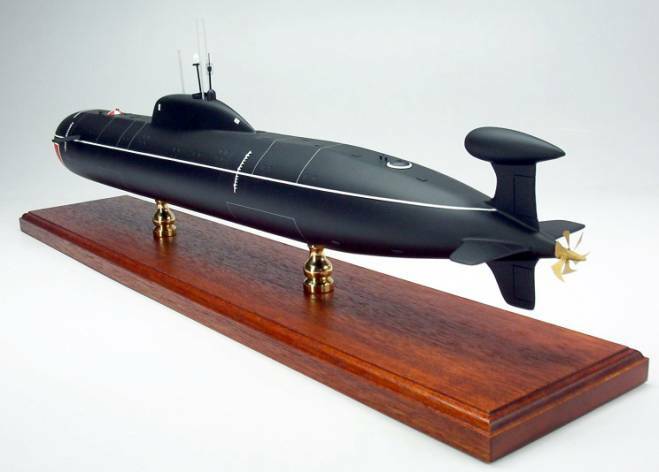 Some 110 meters long, the Akula is double-hulled with considerable distance between the outer and inner hulls to reduce the possible damage to the inner hull. The hull is constructed of low magnetic steel, and divided into eight compartments, and features a distinctive high aft fin. 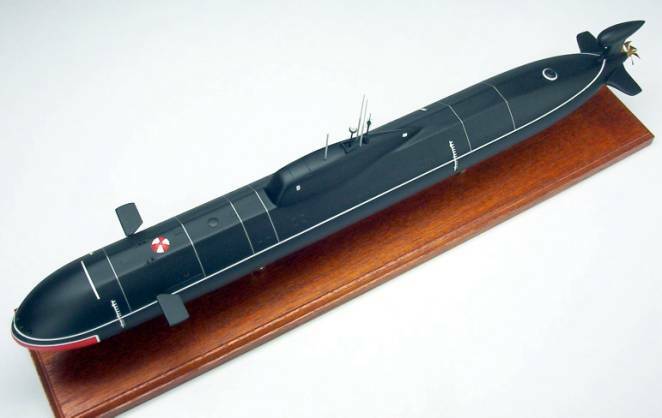 The Project 971, using a steel hull, was initiated in 1976 when it became evident that existing industrial infrastructure was inadequate to mass produce the expensive titanium hulls of the Project 945 Sierra class. The performance of the Project 971 boats was a close approximation to that of the Project 945 design, though the later was significantly more expensive to build and maintain. It has 650 mm and 533 mm torpedo tubes which can use mines as well as Granat cruise missiles, antisubmarine missiles, and torpedoes. Mahogany wood. Scale: 1/240. Length 29 inches.